FEMINEERING ... NEW and YEARS AHEAD! The 1950s: a golden era for women and the feminine arts! 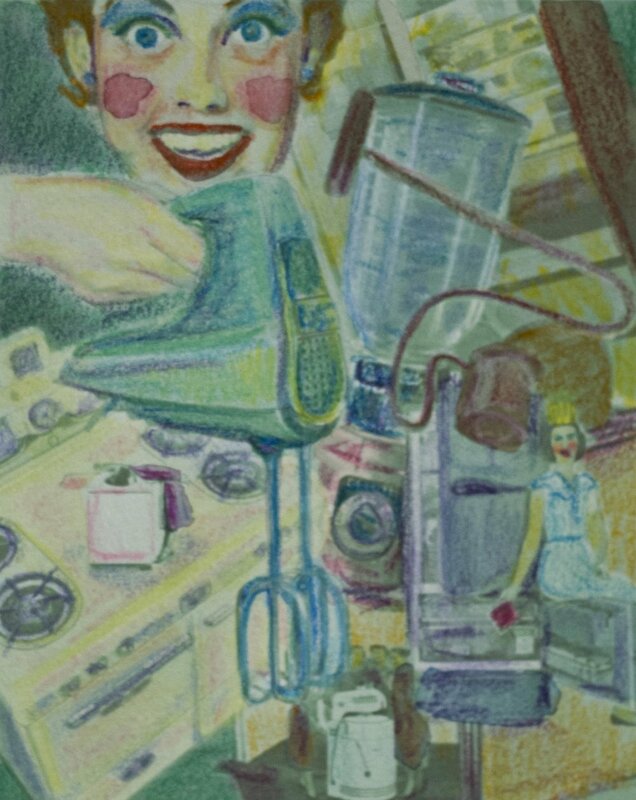 Revisit the the time of the domestic ideal, when homemakers in perms and pumps ruled the kitchen! Marvel at the innovations of Jello, Velveeta, Spam, Betty Crocker, Campbell’s Soup, margarine, mayonnaise, frozen dinners, marshmallows! Be amazed by homes transformed by refrigerators, Hoovers, electric appliances, toilet paper, cellophane wrap, Tupperware, and Formica countertops! These labour saving foods and devices gave us freedom to do what we do best: femineer! 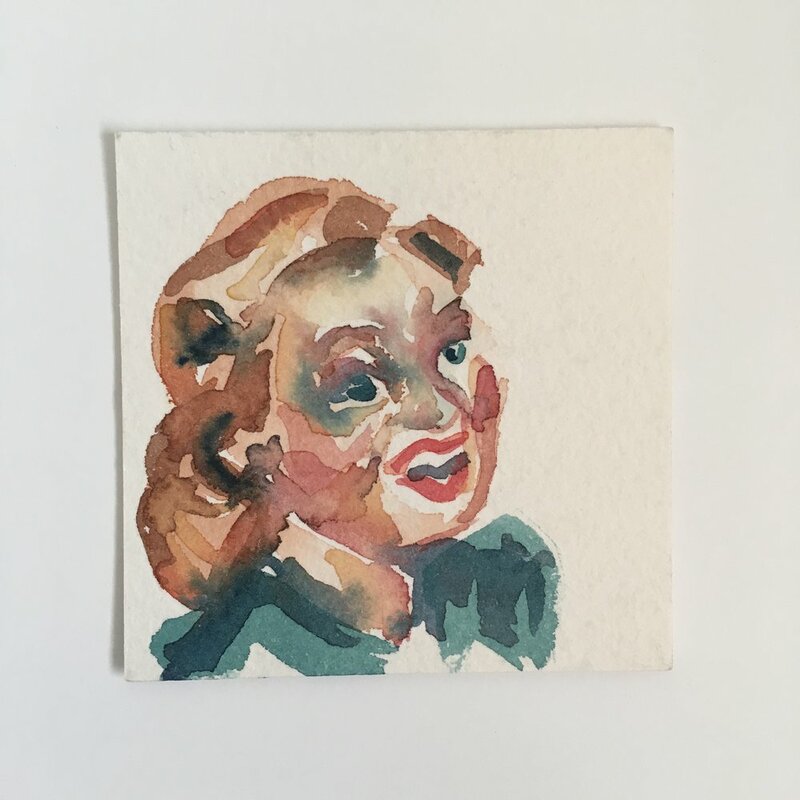 watercolour on paper, 3 x 3"
So FINE ... so SOFT ... so FIRM! Make your STATEMENT! Nothing but nylon makes you feel so FEMALE! Get HAPPIER today! You'll be HAPPIER! To DELIGHT you ... to EXCITE you! Spray away ... and LOVE it! You can put ANYTHING into it and it ALWAYS tastes better! crayon and watercolour on inkjet digital collage, 8x10"
100 ft. roll wraps 100 babies, yet sells at wax paper prices! WRAPTURE! Woman’s bright new problem solver! Quality CHEESE FOOD that's rich in FOOD VALUES! A girl can't help dreaming! In the early 1950s the International Harvester company published an advertisement for “decorator refrigerators” with the tag line: “They’re femineered! ... and YEARS AHEAD!” The ads featured joyful, pretty, white, middle-class, homemakers demonstrating the “revolutionary new idea” of wrapping their refrigerators in fabrics colour coordinated to their kitchens. Sixty years on, it is intriguing to me, as a young female, that aspects of post WWII femininity have returned. In current media and fashion we see people emulating the feminine look of the 1950s. Synched waists, flared skirts, stockings, pearls, stiletto heels, brightly painted lips and nails, and penciled eyebrows emulate a retro pinnacle look of femininity. Why does this image continue to appeal to us when the facade of the “femineer” has been countered by women’s fight for reproductive rights, employment opportunities, domestic property rights, equal pay, freedom from violence? Perhaps to new generations the “dream” is still comforting even though we know it is unattainable? Perhaps we are nostalgic for our mothers, grandmothers, or childhoods? Has the myth surpassed the reality or is there potential irony in this stylistic revival or a savvy political attitude that people are embracing through adapting this role playing? This series of artworks intends to be part critique, part celebration of ‘50s/’60s aesthetics and its apparent rejuvenation. To me this historic genre was an intriguing cultural era with great visual design appeal and a futuristic contemporary flare. . In my visual practice it is not my intention to parody, make fun of, or idealize past generations, but rather to appropriate some of the iconography as a means to examine how we construct our cultural values. Within this series of paintings I have incorporated contemporary models who do not fit the mold of the traditional happy homemaker. Some of my homemakers have piercings or tattoos, some are not Caucasian, some defy the classic feminine body type. Using this morphing of time and place I hope to allow my viewer to recognize the absurdity of specific stereotypes, cultural trends, the pressure of propaganda and its contradictions, in a way that translates to our own generation and time. The day will come when our own time period will be the object of reflection. How will future generations interpret us? How would we like to be perceived and remembered?